Now you have a long and versatile list of keywords and keyphrases to choose from. So let′s brush aside all stuff and shortlist your search terms. Again, you can choose between a free but long way to do this, or use Rank Tracker tool you already know to make this task a snap. You need keywords with high KEI. Relevance (R): it is how closely your keyword is related to what you offer to your customers. Search Volume (SV): it is how many queries are made for a keyword per month. select your region, language and devices you wish to scan the traffic for, wait a little bit and VOILA! you are now armed with the monthly search volumes for your keywords. As promised, below is the description of the available match types. If you′ve already used Google Keyword Tool or simply know how they differ from each other, just skip this paragraph. So, broad match type is the default option. For example, for the query "free ecard" you′ll see the number of searches, containing either or both words "free" and "ecard" in any order, possibly along with other relevant terms. This number may also include singular/plural forms queries and synonyms. Choosing [Exact] match you′ll see how many times per month the keyphrase is searched exactly as it′s entered by a user. And, finally, the "Phrase" match will reflect the number of queries where words are in the same order as in your keyphrase – even if other words are present in that query. 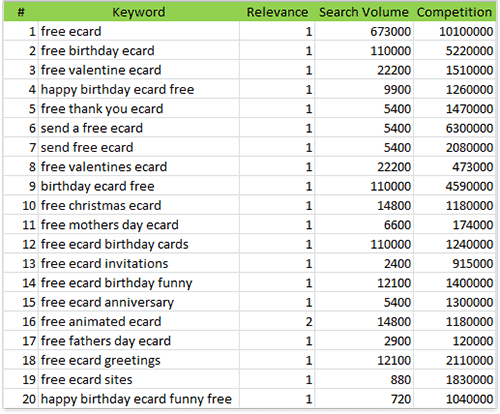 For example, the number of searches for "free ecard", will also include keywords like "free ecard happy birthday" or "free ecard funny". If you are not an international business or by any reasons are not interested in the numbers of search queries from all over the world, select the necessary country in the Local monthly searches column. Note, that these figures may not be exactly accurate, but reflect general trends. Now, in your spreadsheet, make a column for Search Volume and enter the number of search values for each phrase. Competition (C): that′s how many websites try to rank for this keyword. Generally, all sites that have the same keyword as you are your online competition. And the fewer websites are optimized for the same keyword, the better KEI this keyword has. 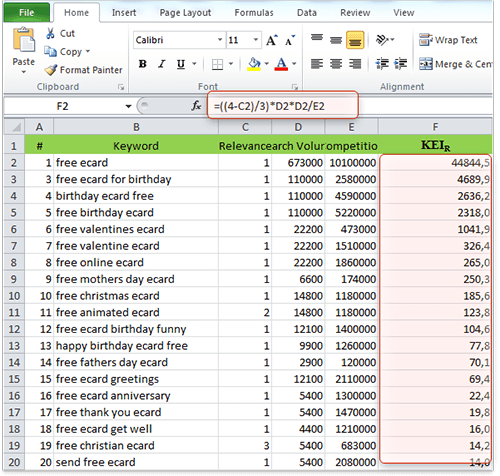 In a separate column for Competition in your spreadsheet, enter values for each keyword. So what makes a KEI better? Higher relevance, higher search volume, and smaller competition. Now, let′s count the magic KEI number for your keywords. Sometimes I also use an improved formula for better estimation. It takes into account real relevance of your keywords. Now make a column for KEI in your Excel spreadsheet and apply the second formula to calculate KEI for each phrase. First, sort all keywords in your spreadsheet by KEI. As I already said, the higher KEI, the better your keywords. Now you′ve got a nice list. We′ll target the green–marked keywords in the first turn, make use of the yellow ones as alternative and mind the red ones just in case. Looks complicated? It definitely does, that′s why I′ll provide you with a quicker and easier way to perform the same check automatically. Stay tuned! I have a doubt regarding relevance(R). The R is assigned manually for a keyword or is there some formula for it. If it is assigned manually, then the result will be varied. Please clarify my doubt. There is no formula for Relevance(R), it is assigned manually for a keyword. You need to value each keyword by its relation to your product or service. I just bought the PDF version of SEO in Practice ! I have read about KEI. hat always seems to be the linchpin of a word being worth marketing to. Yes, create a script &amp; short your list now. But do not forget that Google uses widely corresponds in generating a list of keywords. Is it a problem if I want to use keywords with a lower coefficient? Low KEI means that the keyword does not have much potential. So, your efforts may not get repaid at the end. The KEI concept it is quite fascinating, actually, because brings the math into this ...random (until now) algorithm, but with this we have increased chances to gain this battle!